Miami is a city in United States. The National flag of United States is displayed on the side. Miami (pronounced /maɪˈæmi/ or /maɪˈæmə/) is a major city located on the Atlantic coast in southeastern Florida, in the United States. 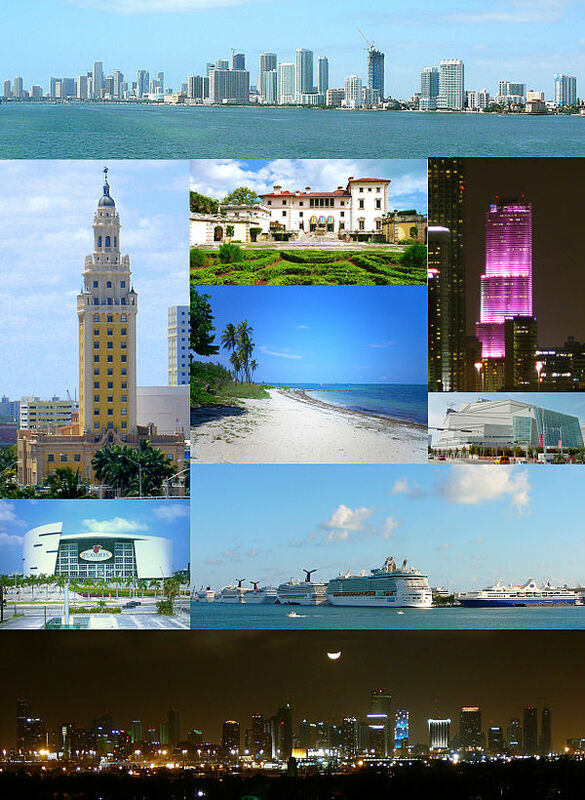 Miami is the county seat of Miami-Dade County, the most populous county in Florida. It is a principal city of the South Florida metropolitan area, which had a 2006 population of 5,463,857; ranking 7th largest in the U.S.. The Miami Urbanized Area (as defined by the Census Bureau) was the fifth most populous urbanized area in the U.S. in the 2000 census with a population of 4,919,036. The United Nations estimated that in 2007, Miami had become the fourth largest urbanized area in the United States, behind New York City, Los Angeles, and Chicago. Miami is well-known as a global city because of its importance in finance, commerce, culture, fashion, print media, entertainment, the arts and international trade. An international center for popular entertainment in television, music, fashion, film, and the performing arts, Miami also has a powerful influence internationally. The city is also home to the largest concentration of international banks in the United States, as well as home to many international company headquarters, and television studios. The city's Port of Miami is the number one cruise/passenger port in the world and is known for accommodating the largest volume of cruise ships in the world, and is home to many major cruise line headquarters. What is the time in Miami? What time is in Miami? What is the local time in Miami? What is the time zone of Miami? Miami Clock - What is it? Miami Time - What is? It is also important to note that this page displays current information about the Current time in Miami and local time in Miami.